1001 Days of Music: "Given to Fly"
Every Song in 1001 Songs You Must Hear Before You Die. Eventually. Dozens of Pearl Jam songs and this is the only one they decided to include in the 1,001 Songs You Must Hear Before You Die. So let's all admit that yes, it's clearly heavily influenced by the sound of Led Zeppelin's Going to California. Whether you like that or not, the song does have it's own merits. It's got very uplifting lyrics, which lead singer Vedder has described as "a fable" and imagined each line as a line in a children's book with a picture to accompany it. I do enjoy the lyrics, it's a great story, for adults as well as kids. The song was written much the way the band built their freshman triumph 10; with the melody and lyrics coming after the song was complete. It's not in my top ten favorite Pearl Jam songs, and it's not even my favorite song from the album Yield. It's not a genre changing or even bending song, it's not "important" and I don't really know why the editors chose it. 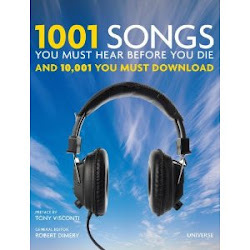 It's a good song, just not their best, but if the other option is nothing by the band, I guess I'll take "Given to Fly"
1001 Songs You Must Hear Before You Die, edited by Robert Dimery. Please go check it out if you are interested in music, or just like the blog.